Felix Yonger outgunned Baily Green to secure victory in a thrilling Champion Chase at Punchestown as trainer Willie Mullins clinched a hat-trick. The 5-1 shot, ridden by Danny Mullins, was one of three runners in the Grade One contest for the trainer. With favourite Champagne Fever and Hidden Cyclone emptying before the home turn, it was left to Felix Yonger and 40-1 shot Baily Green to fight it out. Mullins also trained winners Douvan and Valseur Lido. Douvan (1-6) won the Champion Novice Hurdle while Valseur Lido (15-2) upstaged odds-on favourite Don Poli to win the Champion Novice Chase. Felix Yonger, with three straight wins coming into the race, edged out Baily Green by half a length in the two-mile feature. Hidden Cyclone was back in third, but Champagne Fever was well beaten. With stable jockey Ruby Walsh going with the 3-1 favourite and Paul Townend aboard Twinlight, Mullins was left to partner the apparent third string. "It's great for Danny, who is riding full of confidence," said Willie Mullins. "He gave the horse a breather down the back straight, bided his time and waited for him to fill his lungs up again. It paid off and they are a great partnership. "It was an open race and slightly depended which of them got the bounce of the ball. 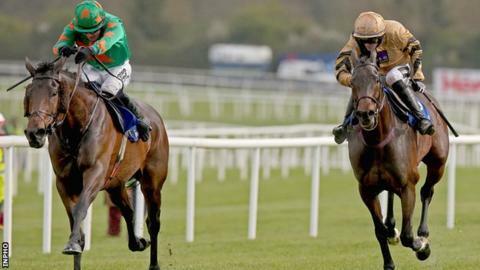 "Ruby (Walsh on Champagne Fever) slipped at the first and they were never right after that. Paul (Townend) on Twinlight hit a wing. "I knew the goodish ground would suit Felix and I doubt he'll go to France, we'll probably put him away now." There was a record first-day attendance of 20,214 at the festival, compared to 19,459 on the same day in 2014.